The SC-IRDA Infrared Communications Interfacesupports communication between a Palm OS-based PDA and a Campbell Scientific datalogger. The SC-IRDA facilitates data transfer without having to open the enclosure door. The SC-IRDA conforms to the IRDA low power SIR specification supported by most laptops and Palm PDAs. Its operating temperature range is -40° to 80°C. The SC-IRDA also supports the SDC protocol (part of the standard operating system in CR510, CR10X and CR23X) allowing the CS I/O port to be shared with modems. Requirements include PConnect Software (version 2.1 or greater) and a Palm OS-based PDA with Infrared capability. 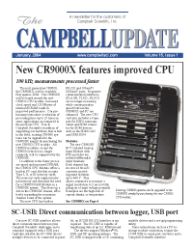 The CR9000 and the CR200-seriesdataloggers are not supported.